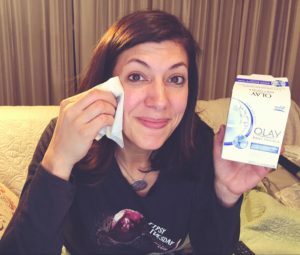 We discovered Olay Daily Facials on the road, and these 5-in-1 facial cloths are a new favorite! They are a makeup remover, scrub, toner, mask and cleanser all in one little cloth I can stick in my suitcase (and not have to explain to TSA!). All you have to do is add water…and then the magic happens. It makes my skin feel so soft and smooth that I sometimes even ask people to touch it. I love that it starts dry, so I never have to worry about the container drying out. And a little goes a long way…sometimes I cut them in half, which is plenty to take my make up off. You can get them here: https://www.amazon.com/shop/onefunnymother.